Yes, it is a really simple dish to prepare once you've learnt how to do it properly. 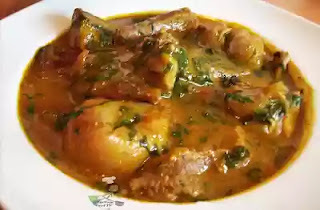 But if you're one of those aspiring cooks who do not know how to prepare this tasty Nigerian dish, then you are in the right place. Pay close attention now—this is how to cook Ogbono soup with Okro. The quantities of Ogbono and Okra below can vary depending on which one you want to have more of. You don't have to be a world class chef to get this right. At this stage its your choice. 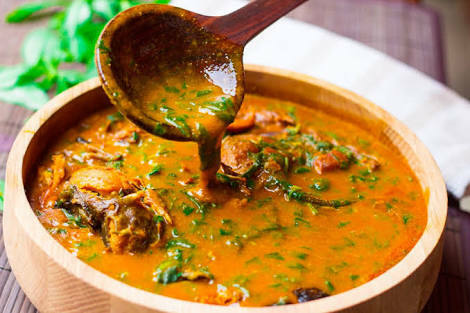 So if you want your soup to be mainly Okra soup, you can decrease the quantity of Ogbono and increase the quantity of okra and if you want your soup to be mainly Ogbono soup, you can decrease the quantity of Okra and increase the quantity of Ogbono. Here are the Ingredients. Lets begin! Start with the main ingredient. Grind the Ogbono with a dry mill. Cut the okra fingers into pieces. To achieve this, you need to make a few vertical cuts followed by horizontal cuts on the okra fingers. Its now time to prepare the green leafy vegetable. Cut the frozen spinach when it is not completely defrosted. It is easier that way. Then when completely defrosted, squeeze out the excess water. Up next— time for the meat to be prepared. Cook the assorted meat with the stock cubes and onion. If you will use Shaki, remember to start cooking that first, then add beef when almost done. Boil some water and set aside. Follow the cooking directions for Ogbono Soup till all steps are complete. Then add the vegetables and stir very well. Add the okra and stir very well. Cover and leave it to heat up very well and it is ready. Served with Semolina Fufu, Cassava ,Garri (Eba), Fufu or Pounded Yam , Amala.